Look at the label of beer #161, Fraoch Heather Ale. It looks very medieval and is getting me psyched up for Game Of Thrones on HBO tonight. Great show by the way…very much like an adult Lord Of The Rings (which I also love). Williams Brothers Brewing Company brews this Ancient Herbed Ale or Scottish Gruit in Scotland. This type of ale has been brewed in Scotland since 2000 BC and according to their website, might be the oldest style of ale brewed in the world. 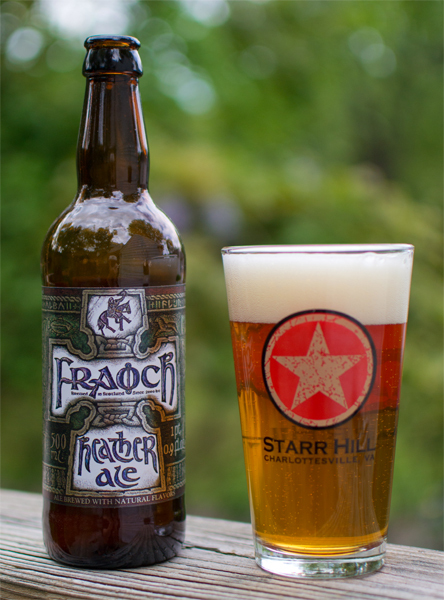 Fraoch comes from an ancient Gaelic recipe “leann fraoich” meaning heather ale. Into the pint glass went this honey colored brew with a frothy white head. It was absolutely mesmerizing to look at with hundreds upon hundreds of carbonation bubbles rising to the top. The nose was very subtle…it had a flowery aroma and was very clean smelling. It had a very nondescript taste…there was a bit of a malt flavor similar to biscuit or cracker and that was about it. I really didn’t get any heather or much of anything else in the flavor which surprised me since it had a bit of a floral like smell. It had a light body to it, light carbonation and was a bit crisp and kind of refreshing. It was an easy drinking beer but that being said…it didn’t make we want to have another. I say give this one to the Jesters to imbibe…there are far more worthy beers out there for a King to pour into his royal chalice.